Governor Wike also declared today as public holiday for Rivers people to pray for God’s intervention in ensuring that the elections are peaceful. Wike, in a state broadcast yesterday, ahead of the general election, said credible intelligence revealed the unpatriotic plot. But, in a swift reaction, Amaechi dismissed Wike’s allegations, saying he has not been in a meeting where violence is discussed. Amaechi said his dance and purported war song during the APC presidential campaign in Port Harcourt, was a way to tell the state governor that this year’s elections would be different from the last elections, where much blood and killings were perpetrated. However, Wike, in his broadcast said: “Credible intelligence has linked Amaechi and his cohorts in the factionalised APC to prevent the peaceful conduct of the general election in Rivers State with the support of some unpatriotic military and police officers. The governor said several Hilux vehicles painted in military colours and gunboats donated by the executive director (Technical) of the Nigerian Ports Authority, have been handed over to the militants to carry out the illegal anti-democratic attacks across the state. While expressing worry on the needless threats of violence by the director general of the APC Presidential Campaign Council at the party’s last presidential campaign rally on Tuesday, in Port Harcourt, Wike said the APC internal crisis was a fallout of the love for impunity, arrogance and disdain for due process. “It is, therefore, most unfortunate that instead of using internal party mechanisms to settle the festering crisis before it was too late, Amaechi chose to act with impunity and is now hunted by the unpleasant outcomes of his arrogance and disdain for due process. Wike advised him to be political matured enough to accept the consistent decisions of the courts in good faith, eat the humble pie, put his damaged political enclave in order and wait for 2023 elections. 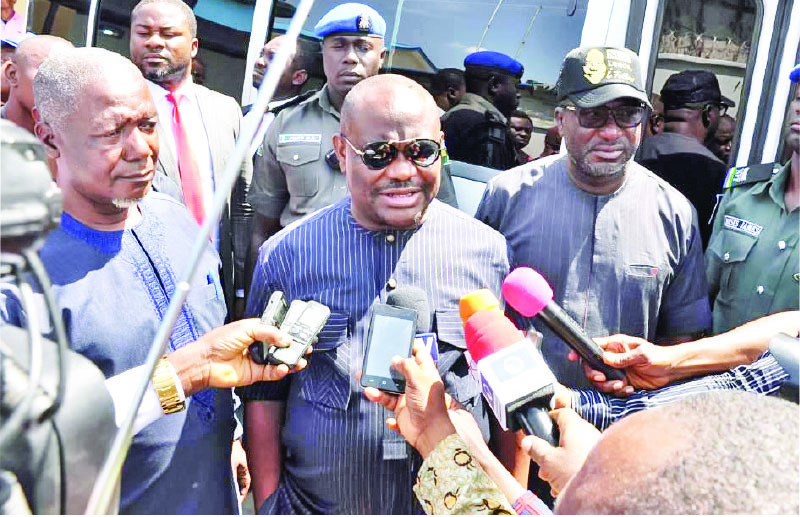 The governor stated that Rivers is peaceful and ready for the general elections. He warned against any negative actions that would upset the peace of the state and disrupt its economic processes which are key to the survival of Nigeria. He said: “I wish to, therefore, appeal to the conscience of Amaechi, as a brother and fellow compatriot, to stop stoking the drumbeats of violence and allow the prevailing peace to continue in Rivers State. “At this point, let me remind us that these are strange and tempting times in our political experience that call for utmost vigilance and maturity in our response to the wilful provocations from the APC and the security agencies, which are clearly working together on a well choreographed script to destabilise the state and prevent the general election from holding,” the governor said. He called on Rivers people to remain peaceful and go about with their lawful activities and refrain from returning violence for violence despite the provocation. The governor called on the international community to hold the former governor and his faction of the APC responsible for any outbreak of violence during the elections. Wike commiserated with the families of those who lost their loved ones during the last APC presidential campaign rally in Port Harcourt. He said: “To lose 15 innocent and lively persons are deeply distressful not only to the immediate families, but, also, to their communities and the entire state. These are active and productive people who still have a lot to offer to the wellbeing of their families and the progress of our state. He thanked God for the violence-free political campaign in the state and prayed that the same will continue after the elections. “I wish to remind us once again, that we are one people with a common destiny. We may belong to different political parties, but there is no other state we can call our home, except Rivers State. “It is, therefore, incumbent on us as leaders and followers, irrespective of political or other affiliations, to continue to work together in brotherhood to build and advance the progress and prosperity of our state and our people with all sense of responsibility and commitment,” he said. Meanwhile, Amaechi, while addressing journalists yesterday evening, said he has never be engaged in any meeting where violence was discussed. The Minister of Transportation, while reacting to the issue of him singing a war song during a presidential rally, denied charting war song, saying his dance and songs were his way of telling his successor that he cannot get away with his (Wike) previous activities of winning election’s in the mixed of blood shade and violence. Amaechi said this time, Rivers people must be allowed to vote without fear of being killed, unlike what happened in 2015. Responding to question on what is the cause of the problem with Wike, the minister claimed it was desperation and hunger for power on the side of his successor.